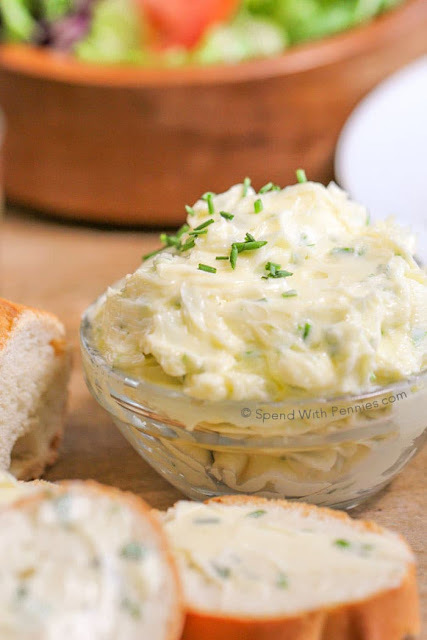 I love garlic butter, it's delicious on bread, veggies and garlic toast. This garlic butter has a secret little ingredient, a dash of lemon juice, making it extra yummy! We make up big batches all of the time so I always have it on hand. The great thing is that you can actually keep it in the fridge for a couple of weeks or even freeze it! I take it straight from the freezer to toss with veggies or into mashed potatoes for a quick and delicious addition. If you'd like to spread it onto bread, you can defrost it in the microwave on very low power for about 15 seconds. To make garlic toast, spread garlic butter over fresh bread and place on a baking sheet. Broil 2-3 minutes or until lightly browned. 0 Response to "BEST HOMEMADE GARLIC BUTTER"